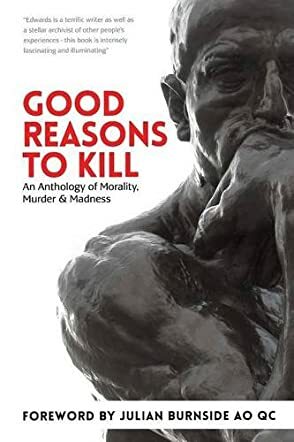 Good Reasons to Kill: An Anthology of Morality, Murder & Madness by Chris Rhyss Edwards is a collection of short stories that asks the same question: is there a good enough reason to kill someone? By being a soldier, I think Mr. Edwards has the ability to see some of the worst that humanity has to offer. In this book, readers get to read case study-like stories of crimes that include murder. We get to see the justification of each crime and the reader is left wondering if there is a reason strong enough to kill someone. Edwards raised some much needed questions about mercy killing, abortion, and many other cases that do not get much media attention because of the subject matter. Despite being a case study type work, Good Reasons to Kill is not boring. It is an enthralling book that makes you wonder and ponder on things that we take for granted. We all hear about murders on the news, but we never try to understand the motive behind the actions. Edwards is not justifying any acts of a criminal nature, he is just putting his thoughts forward. This book has certainly given me a lot to think about. I feel this book is entertaining for the common reader, but it could also be useful for law students or people who want a deeper understanding of the human mind. Plus, I really liked the blurb and the cover of the book. It definitely attracts an audience. Descriptive and informative, this book is truly one of a kind.